Welcome to our monthly P2P recoveries blog post where we discuss the cash recovered in each stage of the collection process. We have tried to assign all recovery payments to a specific stage that was set closest to the payment date. While this approach is not always correct in the case where recovery stages are not promptly updated, it gives a very good overview of the drivers behind recoveries. The total amount of cash recovered in July 2018 was €350,822 (+1.13% since last month), another record breaking amount. When looking at the table above, it shows how effective each stage of the process is at recovering cash owed to investors and can help you understand why some stages are more effective than others. If you haven’t already read about our 3-step collection and recovery process and July’s post then we would recommend that you check them out first. Over 92% of the cash recovered in the bailiff stage was in the second segment “The bailiff is working to retrieve the payments owed from the borrower’s income and assets”. Here, the amount of cash recovered increased by +0.9% (+€1,640) overall compared to the previous month. Looking at Estonia alone, the cash recovered increased by 15.96% (€16,340) in this stage. Along with this, there was an increase of 202.27% (+€32,753) in the cash recovered from cases awaiting a verdict from the courts on the payment order we previously filed. We also saw an increase of 24.4% (+€13,520) in the cash recovered in the ‘The debt collection agency is servicing this loan’ stage. In the default and court stage overall, there was a reduction of -0.76% (-€1,105). 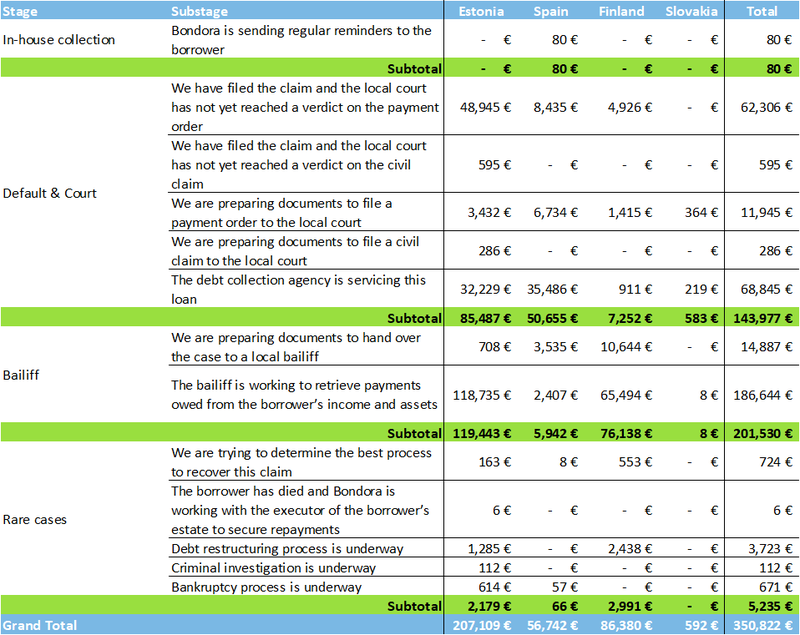 In Spain, there was a significant change compared to last month where a higher number of cases were awaiting a verdict from the courts – in July, the amount of cash recovered by the debt collection agencies in Spain increased by 74.04% (+€15,096). As more court cases reached a final decision in our favor, they were then handed over to the local bailiff who began to work on retrieving payments owed to investors from the borrower’s income and assets. Even though the loans we issue are unsecured, bailiffs have the right to freeze a borrower’s net income and assets and therefore they can make a significant impact on the amount of cash recovered. Ultimately, we aim to proceed to this stage as quickly as possible in order to begin generating a cash flow for investors. Very rarely, Bondora receives a notice about criminal proceedings related to a borrower. After an official notice is received from the authorities, the loan will be frozen until the police finish their investigation and the case is ready to be sent to court. In these types of cases, it is usually extremely unlikely that any funds will be recovered. Other types of rare cases include bankruptcy and debt restructuring. The bankruptcy process is only initiated if the bailiff has not been able to collect the debt after freezing the borrower’s assets and accounts. Bondora either initiates this bankruptcy on its own or joins an existing bankruptcy filing. A distribution plan is then set up by the courts or bankruptcy registrar for the borrower’s assets and depending on the decision from the court, a new payment schedule is created for retrieving the principal. The court may also use debt restructuring to create a new payment plan for the debtor. The cash recovered in the “Rare cases” section decreased by 29.22% (-€2,161) in July. Once all cases can automatically be filed to the courts in all countries, we expect the cash recovered in the bailiff stage to show the largest amounts across all countries. This is important because it means that we can start to generate a cash flow in a more time-efficient manner for investors.